If there's one thing we're craving right now, it's a comfy space to bunker down for the winter. While sprinkling some cozy home décor around is definitely the first step when transitioning our homes to fall à la Nate Berkus, there's definitely an art to striking a balance between comfort and chic factor. One region we can always rely on to get it right is Scandinavia. Let's face it, we all want to decorate like a Swede, style our boudoirs in their minimal aesthetic, and decorate our homes with their iconic Danish, Norwegian, and Swedish furniture designers. Scandinavian interior design never fails to satisfy. So when we needed a few pointers on how to achieve the cozy look with that signature minimal touch, we asked Niki Brantmark founder of the popular My Scandinavian Home and author of Modern Pastoral to show us the way. Originally from London, Brantmark has been living in the South of Sweden for the past 12 years with her Swedish husband and three children. So it's safe to say she knows a thing or two about the style we've come to know and love so much. Ahead she shares her top tips for decorating a cozy home, the Scandinavian way. Adopt the Art of "Hygge"
While there is no direct translation for the Danish word "hygge," Brantmark tells us the general meaning relates to a feeling. "You know, the one you get when you create a warm, ambient space that highlights the good things in life, surrounded by good people (of course) or simply the content feeling you get just being by yourself," she said. "Or as Meik Wiking so deftly puts it in The Little Book of Hygge, 'It's about an atmosphere and an experience, rather than about things.'" If you want to achieve the Scandinavian style at home, you need to mimic this sentiment as well. Brantmark continues: "Danes are masters at the art of hygge, which is why they are said to be the happiest people in the world. They would tell you you don't need much to adopt this art into your lives and you probably enjoy plenty of hygge already. But a great start would be to invite friends and family over for an evening and chat the night away over a hearty stew. Or simply enjoy a hot chocolate in cozy knits over the warm glow candlelight." Now this is a tradition we can all get behind. When it comes to design rules, the Scandinavians aren't privy to just one. However, there are a few things you can keep in mind. Their signature design guideline is to strip it back and keep things simple. "Scandinavians are renowned for keeping their homes simple and pared back," she said. "This could appear cold if it were not for the layers of texture. Think chunky knit blankets, sheepskin throws, natural wood, and leather." So, as Brantmark explains, be mindful of the pieces you layer with. "Add one thing at a time, be careful not to overwhelm the space with too many items and always ask yourself why you're bringing a new décor item to the space," she said. "Each one should have a practical or aesthetic purpose that doesn't overtake the room. They should all work in harmony with each other." To adopt that quintessential hygge appeal and simplistic Scandinavian style, stick to a relatively neutral palette. "Generally speaking, Scandinavians prefer to stick to neutral earthy colors such as white, off-white, grays, and any shades which run along the grayscale spectrum," said Brantmark. "In recent years, there has been a surge in accent walls in dark blue, green, gray, and even black, which do wonders for a cozy, cocoon-like space." Since natural light is a rare commodity in the autumn and winter, Brantmark said the window is an important feature in any Scandinavian room. "A dimmed lamp or lit candle (kept well away from the curtains) on the windowsill ensures a warm and inviting feel both inside and out. If you have the space, you could even create a window nook with cushions and a sheepskin throw. It's perfect for enjoying a morning coffee. (By the way, Scandinavians love their coffee, so a slow-brew coffee maker is also a must!)" So if you love this look too, think about neutral, earthy and washed-out shades often associated with nature. While there is an obvious minimal feel to the Scandinavian look, creating a lived-in look is the key to making it feel warm instead of flat or clinical. And even Brantmark agrees, there is definitely a knack to this. "The key is to make the space look lived-in," she said. "Scandinavians often draw on the nature outside them for inspiration, which is why plants and flowers are a popular. You can also gather pebbles and shells from the nearby beach." If you don't live near the coast, Brantmark says conkers and acorns from the forest also make a lovely seasonal display, especially when arranged in a glass jar with a simple white candle at the center. Incorporating natural textures is a must. "Wooden furniture is a great addition, as are different natural textures such as sheepskin and linen," she adds. "All of these add interest and warmth to the overall look. White or color-blocked walls can be broken up with a gallery wall of prints and favourite photographs arranged in different frames, or one bold statement piece." 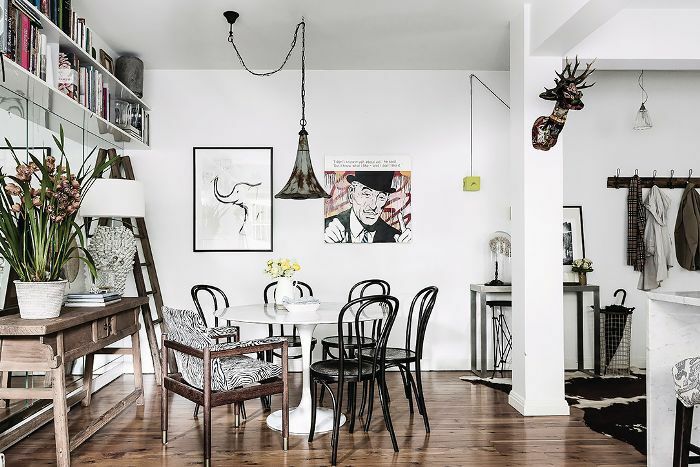 When designing a room, it doesn't matter if you're styling it in the Scandinavian style or in another much-loved format from around the world, the main ingredient is balance. One of the mesmerizing things about a Scandinavian home is the perfect marriage between form and function. "A living room will generally look beautiful but it will also have everything you need to feel comfortable," said Brantmark. "In the planning phase, think about everything you need to make the living room work perfectly for you and your lifestyle. A few questions you can ask yourself are What surfaces do you need? Will you need a standard or modular sofa? When it comes to furniture, consider very high-quality natural materials such as leather, wood, wool, and linen which will stand the test of time, and remember to add plenty of blankets, cushions, and candles. If there's one room in the Scandinavian house that takes precedence over all else, it's the boudoir. It's the holy grail of bedrooms, and we guarantee you've pinned just as many of their messy bed styles as we have. We can't get enough of their linen pendant lights. "Messy, creased, stonewashed linen in earthy colors is almost a must right now," said Brantmark. "Opt for different shades. For example, a dark gray linen duvet cover with light gray pillows and a fresh white sheet will add interest and an element of coziness. A soft blanket at the end of the bed will also make your bed look inviting. "Likewise, curtains are kept simple and fuss-free and often in a beautiful sheer linen. I love them when they are a little longer so they pool on the floor. Don't be fooled, though, there is nearly always a near-invisible blackout blind tightly rolled up behind the linen for summer nights when the sun barely dips below the horizon." When you're trying to achieve that Scandinavian style, there are a few go-to brands Brantmark recommends to finish the look. She's a big fan of the classic midcentury furniture designers such as Hans Wegner, notably the Flag Halyard, and the Wishbone chairs which are at the top of her wish list. But it's the new Nordic designers that really taking her fancy such as Muuto, Hay, and Tradition. "I buy a lot of things from smaller Scandinavian designers such as Finnish duo Saana ja Olli; my good Swedish friend Maria Gustavsson,who designed the Little Darling Lamp; and Danish artist Silke Bonde," she said. "One of my favourite items at home is my Z1 cotton pendant lamp which hangs over my bed (it looks especially beautiful on a dimmer)."